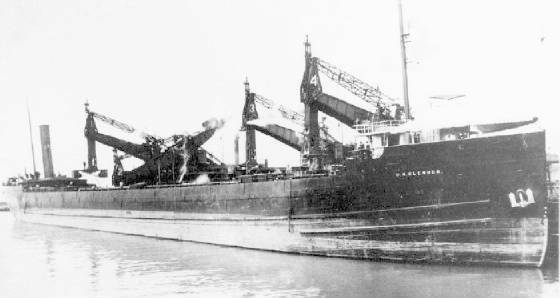 The sinking of the steel freighter D. M. Clemson remains one of Lake Superior’s great mysteries. The 5,530-ton steamship disappeared somewhere off Grand Marais during a winter gale on Nov. 30, 1908. There were no survivors to tell the story. The lake, however, spit out a few clues. For weeks, debris from the ill-fated ship and bodies of some of the 24 sailors who died with it floated ashore along a 40-mile stretch of the desolate winter coastline between Crisp Point and Grand Marais. First discoveries included flotsam and the body of the ship’s watchman, Simon Dunn, of Dublin, Ireland, which washed ashore at Crisp Point. Dunn was wearing a life preserver. Later, pieces of the ship’s cabin, 23 red hatch covers and at least three more floating bodies were seen farther west. Only one other body was recovered. It was identified as second mate Charles Woods of Marine City, Mich. The discovery of the wooden hatch covers led to many debates. Some argued that the covers failed the Clemson during the gale, causing water to flood the hold and sink the ship. Others said they thought the ship broke in two and sank quickly. They said the force of compressed air in the hold of a sinking ship would have caused the hatch covers to blow free. That few bodies were recovered also supported the theory that the Clemson sank quickly and without warning. Crewmembers were either trapped inside the ship or didn’t have time to put on life preservers. The Clemson was under the command of Capt. S. R. Chamberlain of Duluth, Minn. When it was lost. The ship was bound for Duluth with a cargo of coal from Lorain, Ohio, on what was to have been her final trip of the season. It cleared the Sault Ste. Marie locks at 9:30 a.m. Nov. 30 with the steamer J. H. Brown. The two vessels traveled within sight of each other until they cleared Whitefish Point. Captain Chamberlain chose the southern route, which was a more direct course to Duluth, and turned the Clemson due west. Captain Frank Chamberlain, master of the Brown, chose a northern route around Isle Royale because he felt it offered more protection in the fall from fierce northerly gales. Such a gale struck the lake within hours after the two boats parted. Frank Chamberlain said it was the worst storm he ever went through. “Good old Lake Superior was rolling over our decks house-high,” he told a Sault Ste. Marie reporter. The Clemson’s crew apparently was not worried about storms when they turned their ship west. The boat was relatively new, having been launched only five years earlier. Measuring 468-feet in length, the vessel was considered among the giants of its day. Structural damage from an earlier accident might have contributed to the ship’s break-up, suggests author Frederick Stonehouse in his book, “Went Missing.” Stonehouse said the ship struck a lighthouse pier at Ashtabula on Oct. 20. That accident damaged 10 hull plates and a water tank on the starboard side. Temporary repairs were made until the Clemson was laid up for the winter, Stonehouse said.